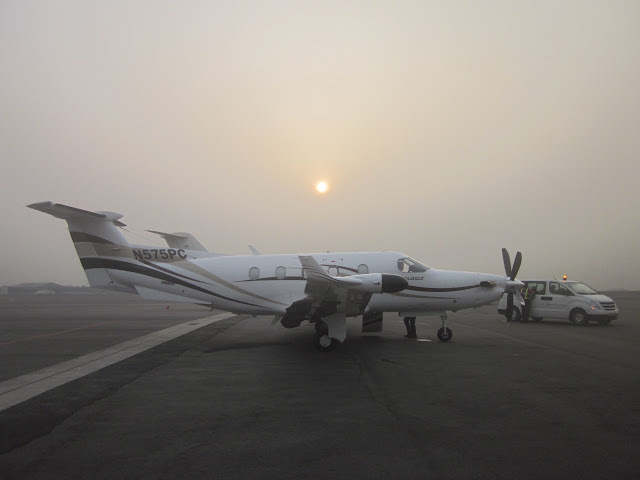 Today the three pilots departed departed Accra, Ghana (DGAA) for a "round robin" flight to the equator and back to Accra. The ladies are in Cape Verde enjoying some birding and the outdoors. The sole purpose of this flight is to achieve our easternmost equatorial crossing and then return to Accra. Generally speaking, when filing an international flight plan, the files route should all be on airways...no direct to a fix type legs. While ATC in the US often accepts flight plans with direct legs, outside the US that is rare. Thus, today's flight plan along airways was very indirect. I suppose since airways develop along commonly traveled routes, our destination of 8.5 degrees east on the equator did not meet that description. The originally planed route was quite an ordeal for Universal Aviation in terms of overflight permits...we needed them from Congo, Gabon, and Ghana. The Gabon permit proved especially difficult and came in just in time after our main contact at Universal asked their senior-most regulatory person to work with the Gabon authorities. The permit came through right before the Gabon permit office closed on Friday afternoon for the weekend (our flight was Sunday). The Presidential inauguration had been the prior day and many of the private and government planes had departed, but a few remained including "Zambia One" which was parked near our bird. Once airborne, with Josh in the right seat for this trip, Accra control seemed unusually flexible about our route. We asked for one shortcut and they immediately said "No problem, approved." The we asked for another which also was quickly approved. So, we decided to try asking for direct to our ultimate goal, 0000N00830E. To our surprise, that was also approved. So, all the airway flight planning and at least one of the overflight permits proved to be unnecessary. Oh well, you have to be flexible when flying internationally. The route as actually flown was much more direct. We had some concerns that Accra dd not really understand our route as they kept asking for our estimate for a fix near the end of the route (GAPAK), but Josh repeated our understanding of the route several times and they always acknowledged it. After getting the more direct clearance, we had no communication with Accra Control for about an hour. When we tried to call them on VHF to see if they had forgotten about us, we were evidently out of their VHF range as we got no response. We tried calling on the international air-to-air frequency (123.45, “five fingers”) to see if an overhead airliner could relay for us…no luck. Next we looked-up an HF frequency for Accra and initially got no response there, but finally they responded. We had been completely out of contact for around 45 minutes, which was a little eerie, but there was no traffic at our altitude anywhere nearby, so it was not a safety issue. It seems FL300 is pretty empty space over the Gulf of Guinea. As a backup, we contacted Sao Tome (a small island nation in the middle of the Gulf of Guinea) approach on VHF as we were flying almost directly over the island. I don’t think they has any idea we were there before we called, so we were glad to let them know of our presence and have good VHF communications with at least one ATC facility as communication with Accra was marginal at best. 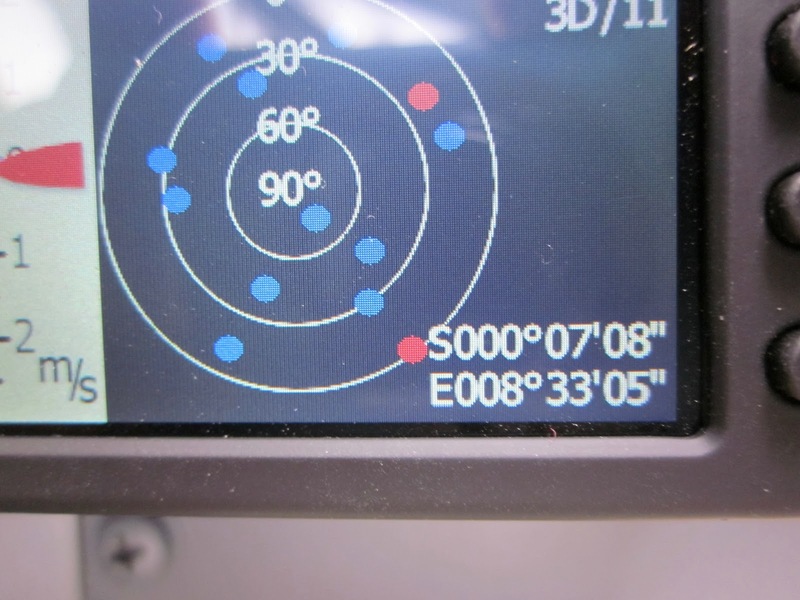 As we approached our intended destination, 0000N00830E, we made sure all the GPS flight recorders were operating normally and pulled out our cameras to make sure we captured the event. Once crossing the equator, we turned-around and headed back to Accra via Sao Tome talking to Sao Tome all along and eventually Accra on HF and then VHF when in range. The last part of the flight was uneventful and ended with another RNAV approach to runway 21 in very hazy conditions. Tomorrow we fly back to Cape Verde which will be our jumping-off point for the Atlantic crossing to Brazil. Oh, yea, and we also pick-up Carolyn and Becky again. We say Cape Verde, but locals now refer to their country as Cabo Verde. Independent from Portugal since 1975, this set of dry, rocky, volcanic islands was a refueling stop during the height of the slave trade. Portuguese explorers brought goats, pigs, cattle and crops, but low rainfall restricted most agricultural to dry-land farming. Still today, corn marches up the steep hillsides, to become the poles for climbing beans, neither of which will see a drop of added moisture for months. Within the last few years, the Chinese have built dams to store rainy season water (but not produce hydro power) which is now used to irrigate crops of banana, cassava, cabbage, and sugarcane that grow in rich volcanic soil. The locally produced produce goes to supply small pensions and bed and breakfast hotels...big resorts still import most of their food. One farming area we passed through was abandoned after a Yugoslavian infrastructure project from the Cold War years (dictators supporting dictators) used beach sand to construct buildings. Within a few years, the soil and aquifer were so poisoned by the leaching salt that nothing would grow in the valley except weeds. The reservoirs behind the new dams make great places for birding and we saw 34 species in two days. Some favorites on our trip (so far) include the purple heron (because it's brown); wax bills (wearing orange lipstick); and the black crowned sparrow-lark (which is neither a sparrow or a lark). 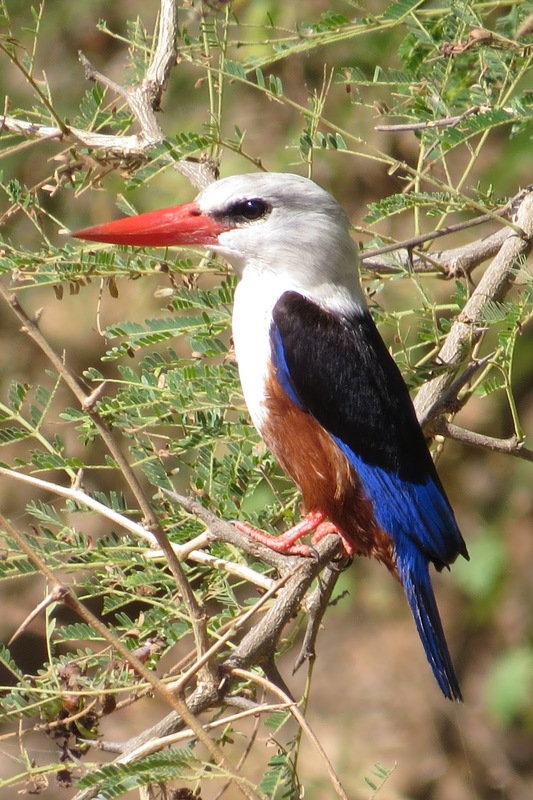 But, stealing the show are the ubiquitous grey-headed kingfishers which are stunningly beautiful and an excellent choice for the Cabo Verde national bird. Thanks, Becky, for this photo of the grey-headed kingfisher. Friday, we birded the botanical garden, which seemed like a tribute to invasive species including casuarina, bamboo, and eucalyptus, oh my! There were workmen repairing stone paths and weeding and pruning so at least there is good effort to make it attractive. As we were leaving, three busloads of German tourists arrived...tourism, particularly from Europe, is the fastest growing industry in this stable, warm, and well educated African country. The government is democratically elected, there are 350 sunny days each year, and education thru age 16 is compulsory with youth literacy almost 100%. Today's explorations included a micro rum distillery and local lunch hotspot. Our hotel was remote and un-fussy, but wonderfully peaceful and clean. It was expertly managed by a Frenchman who assumes my high school French "bonjour, je m'appelle Caroline" means I can understand everything else he says. Sunday was another half day of birding, this time visiting the desert where we watched the amazing acrobatic display of the greater hoopoe-lark. It's a long legged bird about the size of a slim robin and it would chirp several notes before taking off vertically and flying up 10-15 feet before settling right where it started, singing the whole time. That was fun! It's been very nice having more than 48 hours to explore a relatively small country. We only saw one island in this archipelago country, but came away with a pleasant impression of the place. We had one more night at Hotel Vippraia before heading across the Atlantic to Brazil.